1. Select the date of the game you would like to attend from the list of games on this page and click "Buy Now". 2. When the seating diagram appears, click "Troop ID" which appears either in the top right corner of the screen or in the left corner of the screen, depending on which window you have open. 3. If you do not have a Troop ID account, click "Sign up" and follow the on-screen instructions to create your account. 4. 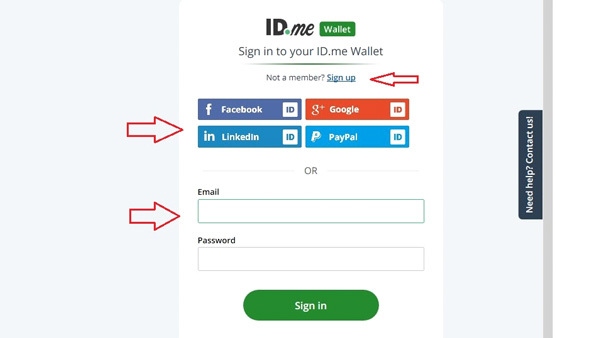 If you already have a Troop ID account, log into your account using one of your social media accounts or use the email and password for your Troop ID account. 5. Once you are logged in successfully, you will see the message below. Click continue to proceed with the ticket purchasing process. 6. The seating diagram will now update to reflect the sections and seats that are available with this military discount. Select the seats you want and proceed with the usual checkout process. Please note this discount is available exclusively online and you can only purchase up to eight tickets. *Military ticket offer is available online only through Indians.com. 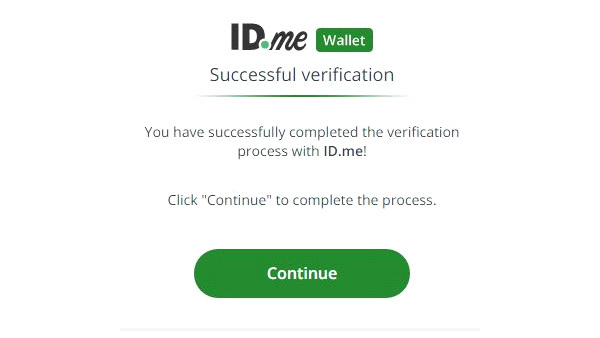 In order to obtain the offer, fans must be properly verified through ID.me within the Indians.com purchase flow. Offer not valid on previously purchased tickets and cannot be combined with any other offer, promotion or discount. All seating is subject to availability. Standard fees apply. The military discount is available for select games for all Active Duty military, Veterans, Retirees, and their spouses and immediate family members. 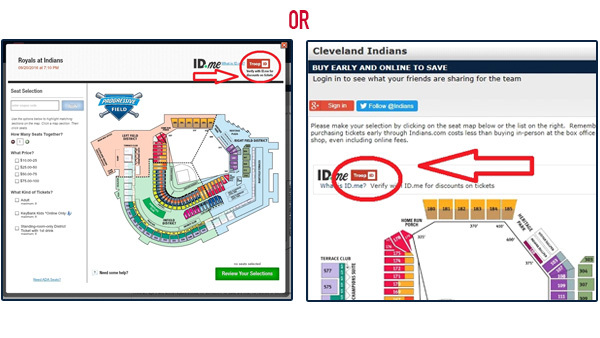 Online ticket purchases are limited to eight (8) tickets per household, business or entity for each Cleveland Indians baseball game. For purchases of more than eight (8) tickets per household, business or entity, please call the Cleveland Indians at 216-420-HITS. Each Cleveland Indians ticket is a limited, revocable license. The Cleveland Indians reserve the right, in its sole discretion, to cancel tickets and/or ticket transactions that violate the Cleveland Indians ticketing policies and procedures, or for any other reason. The Cleveland Indians will not refund any service or processing fees for cancelled transactions due to any non-compliance of its ticketing policies and procedures. Ticket brokers are not eligible for this offer. Tickets purchased using this offer by ticket brokers or those with the intent of reselling the tickets in violation of the Cleveland Indians ticketing policies and procedures may be cancelled without refund of any service or processing fees.